I realize that I am quite delayed with this post, but I felt that I should write something on this seeing as though I own the Galaxy S my self. I stayed up late working on getting the update down on to the phone via the Samsung Kies software, and a quick Google search you reveal to you that this isn't that easy in most cases as the phone and software hardly connect to each other. However after about any hour of getting the Kies software to see the phone, I was able to then download and install the must awaited update. My other little headache when doing this update is that the software would only be updated if the phone was fully charged. Apparently 90% battery wasn't sufficient enough, even though the update occurred over a powered USB cable. Since I had to do a hard reset on my Galaxy in order to connect the Kies software, once the update finished and the phone booted, immediately I noticed some differences. New wallpaper was the first. New icons in the notification bar and more. Over the last few days of using it, I have come to compare the update to Windows. 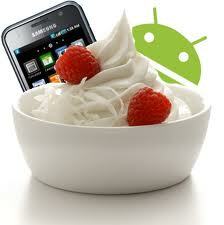 This release of Android on the Galaxy is much like going from Windows Vista to Windows 7. Some big changes, but generally the experience has just been refined to make it so much better. Also worth mentioning, there was a shiny new icon in the applications menu. Galaxy s uses received a free Navigation app from Samsung. The Navigon is a free 2GB download which gives the phone voice turn-by-turn navigation. No need for 3G access, the maps are downloaded on to the phone and can be used anywhere. I tested it out on my way to a clients for work and it is on par with any other navigator on the market. Voice dictation to any text box has been added as well as increased support for Microsoft Exchange. I use Exchange for work and it now supports PIN requirement and forced me to create a PIN for mode phone. If you have the Galaxy S, I highly recommend you get this update and enjoy the phone even more. While fixing an issue with AVG on a server today (http://bit.ly/en7LtY) I was confronted with an issue where the server wouldn't actually finish booting. The server would remain on "Applying Computer Settings" and wouldn't actually proceed no matter how long I waited. What I hadn't realized was the problem was that earlier I had unticked IPv6 from the primary network card. I often do this on workstations I build and work on for work and only did it really out of habit. But it didn't clikc with me when I did this on the server. SBS 2008 apparently needs IPv6 to function regardless of whether or not you actually use the protocol. So if you find yourself in this situation, take a look in your network card settings and ensure that you have IPv6 enabled on your card even though are not using IPv6. I had this problem today while at a clients, and I was a able to find a fairly simple fix and I wanted to share it on. With various versions of AVG, but I experienced it with AVG Business Edition 2011. When you open the console and you find that the Update Manager is disabled, try these steps. Restart either services or your computer and then force an update on the AVG. Once the update is complete, you should find that the Update Manage is enabled and working.